Here are some quick environmentally friendly suggestions for using some of your leaves instead of bagging, blowing or raking all of them to the curb for pick-up. This will not only save you time and money, but reduce noise and air pollution, improve your physical health, and most importantly, benefit wildlife and plants. Please read the funny story that’s been around for quite awhile called “GOD AND ST. FRANCIS HAVE A CONVERSATION”. A former coworker Shari G. at the Natural Garden Nursery (now out of business sadly), shared this with me over 16 years ago. I don’t know who wrote it, but after reading it you’ll get a new perspective as to why some of our landscaping practices, such as raking away leaves, really don’t make any sense. Throw leaves into your compost pile. Leaf mold (another name for composted leaves) makes wonderful mulch, vegetable garden amendment, and has several uses in organic lawn care. I use composted leaves instead of wood mulch in most of my landscaped gardens since it’s environmentally friendly, cost effective and mimics the way Mother Natured mulches. Rake or leave most of your fallen leaves (and fallen twigs) around trees, shrubs and woodland perennials. This is the way nature mulches! If possible, do not chop most of your leaves to protect overwintering insects and other small animals which use the leaves for shelter, food or nesting material. 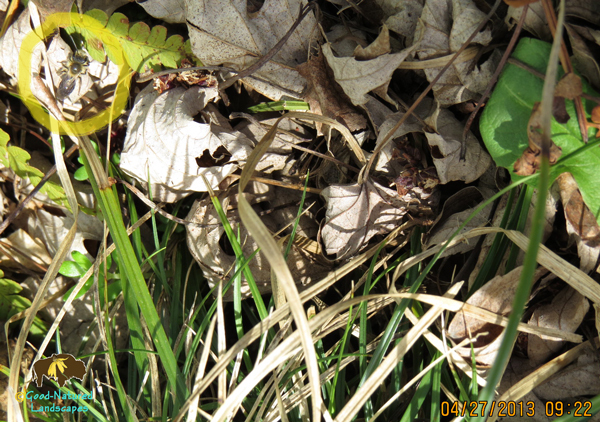 Leaves also provide organic matter, moisture, and some weed control similar to mulch. What would happen to this bee if I chopped up the leaves? BTW: I do not rake leaves into my prairie garden because I do a prescribed burn each spring. Read more about my prescribed burn in Preparing for the arrival of the Red Buffalo. Chop up a light layer of fall leaves on top of your lawn with a lawn mower several times and leave in place to enrich your lawn. Do not chop leaves in other areas as explained above. Rake leaves around a grouping of potted native perennials or shrubs you didn’t get a chance to plant this year, to add an insulation layer over winter. Use leaves to smother more areas of lawn for future wildlife gardens by piling leaves over layers of black and white newspaper and enclosing with chicken wire fencing to prevent leaves from blowing away. Here are 2 easy craft leaf projects I developed when I coordinated an after school environmental club. Craft projects are great opportunities to discuss why some leaves fall off some trees or change color. USDA Why leaves Change color? Project 1: Press various types of leaves between 2 heavy books lined with paper towels for 2 weeks, and use the pressed leaves to create name cards or decorations for your Thanksgiving table. Use gold or silver permanent marker to write guests’ names on the pressed leaves. Project 2 : collect leaves of all different shapes and colors, then after pressing them using the method above, glue them onto a 2′ diameter by 6 inch wide circular cardboard wreath cut from a rigid box. Make sure to cover the cardboard completely with leaves .Then hang the leaf wreath. Beautiful! If you have to remove leaves, try raking your leaves instead of blowing them if you are physically able to or instead use an electric mower or blower (less noise and air pollution than gas powered equipment). Also, do not rake leaves into nearby waterways (rivers, lakes, streams, storm drains, drainage pipes, etc). The excess volume of decaying leaves can harm aquatic species. Tip: As I rake leaves away, I keep an eye out for wildlife and move them back into the garden if I spot something. It does take a little extra time, but it’s worth it to me to save a few. It’s amazing, but something that looks like a grub could be a firefly or butterfly larva if you take the time to I.D. Have fun!!! Toss the leaves around, enjoy the sound of walking through the leaves, and jump into a pile! 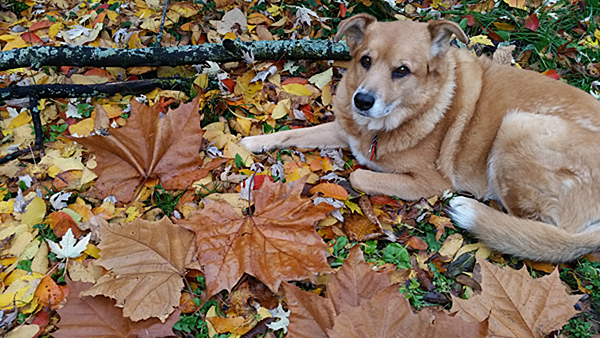 Mother Nature doesn’t rake up her leaves.Why do we? GOD: “Frank, you know all about gardens and nature. What in the world is happening down there on the planet? What happened to the dandelions, violets, milkweeds and stuff I started eons ago? I had a perfect no-maintenance garden plan. Those plants grow in any type of soil, withstand drought, and multiply with abandon. The nectar from the long-lasting blossoms attracts butterflies, honey-bees and flocks of songbirds. I expected to see a vast garden of colors and all I see are these green rectangles. ST. FRANCIS: It’s the tribes that settled there Lord. The Suburbanites. They started calling your flowers ‘weeds’ and went to great lengths to kill them and replace them with grass. GOD: Grass? But it’s boring. It’s not colorful. It doesn’t attract butterflies and bees; only grubs and sodworms. It’s sensitive to temperatures. Do these Suburbanites really want all that grass growing down there? ST. FRANCIS: Apparently so,Lord. They go to great pains to grow it and keep it green. They begin each spring by fertilizing grass and poisoning any other plant that crops up in the lawn. GOD: The spring rains and warm weather probably makes the grass grow fast. That must maker the Suburbanites happy. ST. FRANCIS: Apparently not, Lord. As soon as it grows a little they cut it, sometimes twice a week. ST. FRANCIS: Not exactly Lord. Most of them rake it up and put it in bags. ST. FRANCIS: No, Sir, just the opposite. They pay to throw it away. GOD: Now let me get this straight. They fertilize the grass so it will grow. And then they cut if off and pay to throw it away? GOD: These Suburbanites must be relieved in the summer when we cut back on the rain and turn up the heat. That surely slows down the growth and saves them a lot of work. ST. FRANCIS: You aren’t going to believe this, Lord…when the grass stops growing so fast, they drag out hoses and pay more money to water it so they can continue to mow it and pay to get rid of it. GOD: What nonsense! At least they kept some of the trees. That was a sheer stroke of genius if I do say so myself. 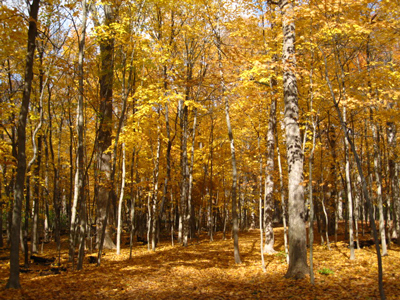 The trees grow leaves in spring to provide beauty and shade in the summer. In the autumn, they fall to the ground to and provide a natural blanket to keep moisture in the soil and protect the trees and bushes. It’s a natural cycle of life. ST FRANCIS: You better sit down, Lord. The Suburbanites have drawn a new circle . As soon as the leaves have fallen, they rake them into great piles and pay to have them hauled away. GOD: No! What do they do to protect the the shrub and tree roots in the winter to deep the soil moist and loose? ST. FRANCIS: After throwing away all the leaves, the go out and buy something called mulch. They haul it home and spread it around in place of the leaves. ST FRANCIS: They cut down trees and grind them up to make mulch. GOD: Enough! I don’t want to think about this anymore. St. Catherine, you’re in charge of the arts. What movie have you scheduled for tonight?